Northern Minnesota has great golf. That is well-known to the many golfers in this state and even to some who travel here. 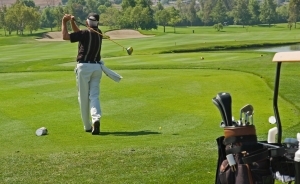 Courses at such resorts as Madden’s, Grand View Lodge, and Giants Ridge have hosted golfers for years to great success. But if you are looking for something just off the beaten path, there are other northern Minnesota resort options that offer great golf and are well-worth checking out. To begin with, golf in northern Minnesota provides some of the best golf vacation opportunities you can find. Whether it is the quiet beauty of the northern woods or unsurpassed challenge on courses with conditioning found at the highest-end courses around the country, northern Minnesota will roll out the bright, “green carpet” for your next visit. Here are a handful of resorts to add to your must-visit list. Black Bear Golf Course in Carleton, Minn., is just down the road from Duluth and the land of Lake Gitchegumee, where Minnesota vacations abound. The golf course at Black Bear is a scenic walk through the northern Minnesota woods, and with tees from 5,072 yards to 6,560 (for which the slope is 138), there is a challenge for every level of golfer. You will remember the beauty of Black Bear (and its bear paw shaped sand trap) when you are relaxing at Black Bear Casino Resort after your round. Travel northwest out of the Twin Cities and you don’t have to go far before you will find a fun golf challenge at the Territory Golf Club nearby St. Cloud, Minn. The Territory famously blends Scottish links style golf with the north woods forest terrain Minnesotans know and love. The varied holes will test every facet of your game, and you may particularly enjoy the elevated tee shot on No. 11 — a 184-yard par 3 over water with hazards and trees on both sides. Getting home on your drive will put a smile on your face. Head further northwest along I-94 and you will come across a triumvirate of golf courses that will make for a great golf vacation. The first stop is Alexandria, Minn., where you find Arrowwood Resort and Geneva Golf Club both set in and around beautiful lake country. Arrowwood Resort features the newly renovated Atikwa Golf Club near the shores of lovely Lake Darling. The views are breathtaking, and the amenities at this gorgeous north woods resort — which include a spa, waterpark, and horseback riding — are worth the visit. Geneva Golf Club has even more golf in a beautiful setting. The 27 championship holes designed by prolific Minnesota golf architect Joel Goldstrand are called The Pines, Marsh, and Island courses, which gives you an indication of the natural beauty of the area. With all that golf, Geneva Golf Club provides a challenge for everyone and a golf vacation you will long remember. Finally, just up the highway is Thumper Pond Resort, located in Ottertail, Minn., which is ranked among the best resorts in the state. The property is tucked away among 250 acres of swaying red pines and offers the beauty and quiet serenity of the great north. And if you are looking for a little indoor entertainment, the Indoor Water Entertainment Center is opening in 2016 to provide fun for everyone in your group. You can’t go wrong on your golf vacation in Minnesota, and you’ll find the trip of a lifetime visiting these great northern Minnesota golf destinations. Explore Minnesota Golf Alliance is a non-profit membership organization whose mission is to raise awareness of Minnesota golf courses and resorts as international travel destinations. Our member facilities feature award-winning, championship golf courses and are geographically disbursed across the great state of Minnesota. The combination of exceptional quality and outstanding value make Minnesota one of the best golf destinations in the United States. The first step to fix your golf swing is to diagnose what is not working. Plenty can be learned from paying attention to what happens to the ball after it is hit.